Unfortunately, Gmail does not provide a feature to create HTML email templates. Many professionals or Individuals want to send HTML based mass emails or newsletters in Gmail. The good news is that you can create HTML templates in SalesHandy and use them in your Gmail/G Suite account by adding SalesHandy’s Chrome extension. If you are looking for a way to create HTML email template in Gmail then you have come to right place. Skip reading and Jump straight to video! Why should you send email newsletter using Gmail if you have limited number of recipients? You can easily create and send a newsletter using software like MailChimp or GetResponse, but almost all the time, emails will land in the promotions tab instead of primary inbox. It is because these software uses personal servers to send emails. If you send the same newsletter email from your Gmail/ G Suite account, your emails will hit recipients’ inbox because all the emails will be sent from Google’s own servers. But, if you have a list of 10k recipients or more, then you can not send newsletter email to all the recipients in one day because Google has provided certain daily email sending limit for Gmail and G Suite users. For Gmail users, daily email sending limit is 500 recipients and 10000 recipients if you have G Suite account(Know more about Gmail/G suite’s daily sending limit). So if you have limited recipients, you can send HTML email template in Gmail using SalesHandy. Here are three simple steps to create and send HTML newsletter in Gmail. First, create an account in SalesHandy from this Signup page. After creating an account, install Chrome extension. Now, refresh to see SalesHandy in your Gmail account. The image shows exactly from where can you access the templates. Set Up Chrome Extension in 60 Sec! To create HTML templates, go to “Templates” and click on “create template.” Now, click on “Source code” icon (<>) and paste your HTML code. Now, you have created an HTML template in your Gmail. Simple and Easy Email Templates. Send NOW! You can share your templates with your team members with just one click. You will find saved templates assorted under “Team” and “Personal” labels when you click on “Template” icon to add one to an email. SalesHandy provides success rate for each template. You can measure the performance of your templates and know which one is performing better. The success rate is the rate of unique opens divides by template’s usage. SalesHandy also provides integration with Outlook. If you are an Outlook user, you can use templates in your Outlook. 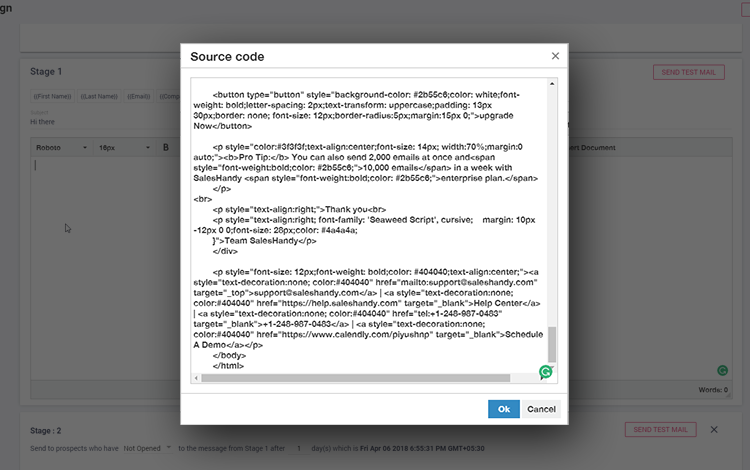 Use templates when you send mail merge Campaign from SalesHandy. Create follow-up email templates and save your time. SalesHandy allows you to create various folders and share it with a specific team. You can also set preferences like “Can create”, “Can edit” and “Can delete” while sharing folders with your team. 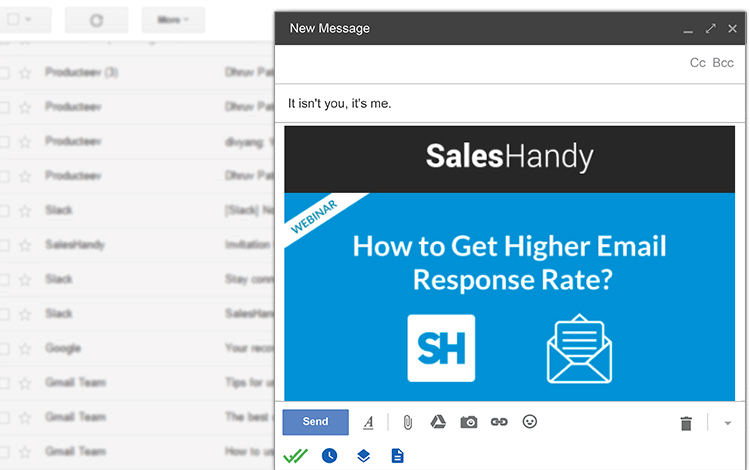 Create and save email template directly from Gmail using SalesHandy’s Chrome extension. Leverage the benefit of highly valuable and proven pre-saved email templates created by experts at SalesHandy.